Don’t live life with foot pain! 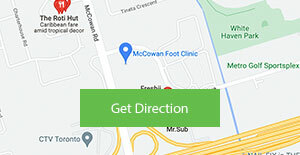 If you’re suffering from an ailment of the feet, McCowan Foot Clinic’s team of Chiropodists will work with you to assess the problem and develop a treatment plan. It’s our goal to help you achieve a pain-free lifestyle.